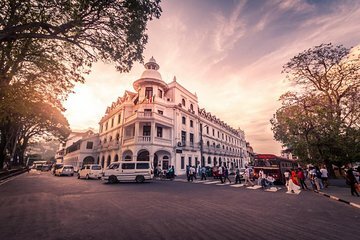 If you’ve only got limited time in Sri Lanka, spend less time planning and more time sightseeing on a 3-night tour that provides a cultural and historical introduction for first-time visitors. Without having to worry about arranging transfer, accommodation, or activities, you’ll travel between Negombo, Kandy, and Kithulgala and benefit from the insider knowledge of a guide throughout. We were greeted at the airport by the guide and driver on arrival which was way after midnight. Was reassuring to know that we were in safe hands. As it turned out, the guide, Philipp Muller was actually the owner of local tour operator, Travelasia Vacations Pte Ltd who tagged along this time to check the tour facilities, standards, etc. On arrival at the hotel, Philipp personally checked our room to make sure it was OK. The personal touch was welcomed. The hotels at all three locations were good and clean even though we booked the 2 star option. I thought it was more 3 star rated. Breakfast at all locations were also more than sufficient and of good quality. Overall the attention to detail allow both my wife and I to really enjoy a relaxing trip and to move at our own pace. The driver Mr Mahendha also made sure that we were always comfortable and drove safely. I would not hesitate to recommend going on your tours with Travelasia as you will really enjoy it.